Discover how we make renting a dumpster in Pennington, NJ a simple and easy process. 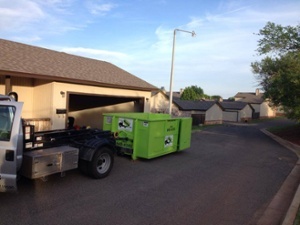 Bin There Dump That is committed to making the dumpster rental process for the customer a seamless transaction, from placing an order for the needed dumpster size to delivery of the waste container in Pennington to an immediate pick up when you no longer need the bin on your driveway. Depending on the size of dumpster you have, then the weight it can carry will vary. The smaller the dumpster, the less it is able to hold and vice versa. For small heavy objects, we always advise on small to medium dumpsters to cap the weight at a certain amount. If a large dumpster gets too heavy, it gives our Delivery Experts a difficult time to load the heavy dumpster on to our trucks. Some franchisees dumpster rental fee includes a specific amount of tonnes dependent on the size dumpster you want to rent. Because franchisees follow their own pricing guide please call your local Bin There Dump That to speak to a Dumpster Consultant to advise you on what size is best for your project. Pennington is a small borough in the state of New Jersey between New York City and Philadelphia. It’s the beautiful small town most of us dreamt of living in when we were growing up. In today’s modern world, even small towns have many modern amenities, but this town only has the ones it needs for its residents to live a comfortable life. The boroughs downtown has many shops and restaurants, but none of the big stores you find in most towns these days. This is a place that believes in the benefits of mom and pop business ownership. There’s a pizza place, but it’s not a national chain. The same goes for the drugstore and the hardware store. The supermarket is locally owned and operated as well. Everything moves at a slower pace in Pennington and that’s just the way residents like it. The area would have looked a lot different in the 1600’s, but that’s how long people have been living in the area. It began life as a town where people could stop for a rest when travelling between Philadelphia and New York and some even stayed. There are several historical landmarks that have been around since those early days. The Presbyterian Church is one of the oldest buildings in town, built in 1708. Pennington has a reputation as a safe place to live. It’s a town where parents can still let their kids walk to school without worry. This is just one of many benefits that has convinced people living in New York and Philadelphia to think about making the move to the borough. Your local Dumpster Rental Experts Pennington dumpster rental operators are Danny & Karen Aller.